With the advent of the holidays, most of us also are also experiencing a change in temperature. As Jack Frost starts nipping at our noses, it is important that we have what we need to keep our baby warm and cozy throughout the next several months. There are onesies, buntings, puffer coats and all sorts of options. However, outfitting a baby can be like wrestling with a small alligator, and sometimes too much is just, well, too much. We have some tips on how to keep baby warm in winter and easy options for you that will give your baby what she needs to be comfortable, safe and healthy — and allow you to get outside without preparing for the Blizzard of ’53. So, snuggle up as you hear what you need to keep your family warm and toasty this winter! Your Plus One: The tried-and-true rule of thumb is that your baby should be dressed in as many layers as you need, plus one. If you are in long-sleeves and a jacket, do the same for your baby, plus an extra layer like a blanket or a sweater. For the bottoms, do a fitted option like leggings and then add a pair of pants over top. If you are doing just one layer on top, mimic that for your child and add a hoodie, sweater or sweatshirt. Blankets become your best friend as it is easy to tuck one around your child’s car seat or stroller so keep one – or three – on hand. Thankfully, if you layer your little one’s outfit, you can easily remove or add as the weather changes. Don’t Overheat: All too often, our thought process is to kick up the temperature and pile on the blankets, all in the name of keeping our babies healthy. The ideal household temperature is between 68-72 Fahrenheit and that includes at night when your child is sleeping. Overheating, especially at night, can also be a risk factor for SIDS, per Dr. Janice Montague, Director of Pediatrics at Good Samaritan Hospital in Suffern, New York. The “plus one” rule still applies indoors so remember that as you’re dressing your child, even for an indoor day. At nighttime, do not bundle your child under tons of blankets as not only is that too much but also loose bedding in the crib in dangerous for a baby. Rather, receiving blankets, well swaddled around your child, comfortable sleep sacks, or one-footed sleepers are perfect for a baby, combined with a onesie underneath. 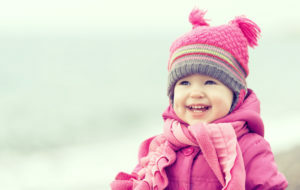 Accessories: Even at this age, it is helpful to have the appropriate winter gear like hats, coats and mittens. Hats should velcro or snap under your baby’s chin or you may never find them after the first wear! Puffy coats are great for colder climates but remember to always take this layer off when you’re strapping your baby in her car seat. The car seat straps are designed to be snug against your child and extra layers under the straps – like coats or blankets – can interfere with the effectiveness of the 5-point harness. Instead, remove the coat and if you need to use a blanket, tuck it over top of the straps and car seat, up to chest or chin level. Aside from keeping little heads warm, you want to keep her feet and hands covered and warm when the temps drop. Indoor vs. Outdoor: We’ve mentioned that you don’t want to overheat your little one indoors and the “plus one” rule, but you also want to remember that once you and baby go inside, it’s good to remove a layer of clothing. So as you are running into the grocery store or Super Target, even for “just a second,” remove your baby’s jacket or sweater so that she won’t perspire. A little dampness will only just be colder once you run back outside. Enough is Enough: Even though it may be cold outside, that doesn’t mean you and your little one have to stay homebound until April. In fact, fresh air is almost always a good thing for babies. But what is enough and when is it too much? First, always remember the “plus one” rule and if you’re off for a walk, be sure to have a blanket in the stroller to tuck around your baby. Typically, brisk winter walks for a healthy, full-term baby are fine, but avoid freezing temperatures and keep in mind that young babies cannot regulate their body temp yet. When in doubt, stay in. Signs that your baby has had enough or is getting too cold? Teary or watery eyes, fussiness, shivering, or if her lips start to turn blue. Additionally, if your baby’s nose, ears, or fingertips are whitening or turning pale, you should take her inside. Baby, it’s getting cold outside but with these tips, a little winter gear and some common sense, this winter doesn’t have to bring cabin fever to your family! ← Can You Put Lotion on Your Baby?